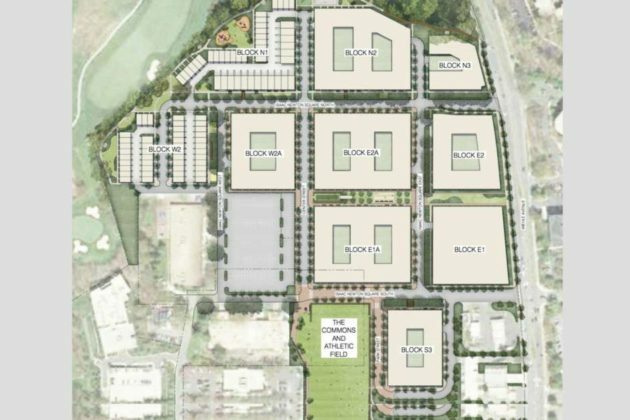 Peter Lawrence Cos. and MRP Realty submitted plans in late August to redevelop two-thirds of the office park with 2.8 million feet of development, nearly 90 percent of which would be residential. The development would be spread across roughly 32 acres that Peter Lawrence Cos. controls. “We spent a lot of time developing the project vision, and we’re proud of it,” said Andrew Painter, the development team’s legal representative. The plan is in line with the county’s comprehensive plan, which has long envisioned the office park’s future as entirely residential. The project is north of the Wiehle-Reston East Metro Station. 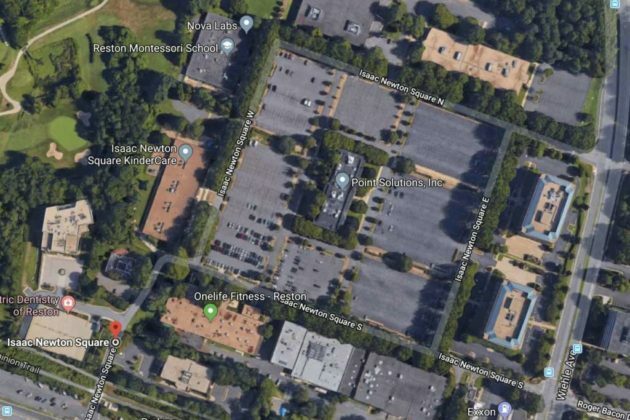 Painter told Reston Now that the development team intentionally designed the project to serve as a transition between the higher density areas close to the Metro Station and established residential communities towards the north and east of the property. The site is bounded by Hidden Creek Country Club, a gas station and a fire station, which will be rebuilt. “Building heights will generally taper down as one moves from south to north, and our planned “Nature’s Edge” area rings the proposed neighborhood, which provides a landscaped buffer and path along our northern and western edges adjacent to Hidden Creek,” Painter said. Residential units will be a mix of apartments, condominiums, flats and townhouses, which 14 percent of the total number of units being set aside as affordable units. The proposed neighborhood will contain up to 10 development blocks with a mix of residential, retail and office uses. The heights of buildings and the intensity of the development will taper off near the existing woodlands near the southern edge of the property. The developer plans to preserve the property’s row of mature Willow Oak trees, by creating a new “Willow Oak Park.” The 1.45-acre park will serve as the “heart of the neighborhood’s public realm,” according to the proposal. A full-size athletic field open for active recreation activities will also be included in the plan. Roughly 25 parking spaces will be reserved for field visitors during designated times. A neighborhood green, just under half an acre, will sit next to the athletic field. A 0.75-acre east-west pedestrian walkway, called the “community mews,” will serve as a mid-block crossing connecting Wiehle Avenue and parcels to the west. Unlike the athletic field and community green, this “mews” will be reserved for residents only. The plan also calls for “The Commons,” the neighborhood’s commercial center. The developer will create a connection to the Washington & Old Dominion Trail. Infrastructure on the property will also support cycling. Although an overwhelming majority of the development is residential, 260,000 square feet of office uses will be present nearest to the Wiehle-Reston East Metro Station. Roughly 68,884 square feet of retail uses are also proposed. The plan hasn’t been accepted for review by the county yet, according to Brian Worthy, a spokesperson for the county.